In 1982, Yosuke Abe (guitar), Yoshihiro Yasui (bass), Shinya Tange (drums) and Kazutoyo Ito (vocals) got together in Nagoya to form the band OUTRAGE. Playing in the club circuit of Nagoya they mainly did covers of NWOBH. In 1986, with the departure of Ito, Naoki Hashimoto joined thus solidifying the first line up. In 1987, their self titled debut mini-album was released from their self owned label. Outrage’s highly skilled thrash metal playing was already globally competitive and attracted tremendous interest, being said as “an amazing band of 18 year olds has appeared”. In 1988 they made a major debut from Polydor Records (currently Universal Music) with their first full length album “Black Clouds”. In 1989, their sophomore release “Blind To Reality” was soon followed by their 3rd release “The Great Blue” in 1990. By this time Outrage’s out of the ordinary talents differentiated them from other bands in Japan. They then did their first foreign recording session with producer Stephan Kaufmann at the helm. This 4th album “The Final Day” was released in 1991 and became Outrage’s signature work, greatly recognized abroad as well as in their country. Their final tour date in support of this album at Club Citta in Kawasaki gathered media, management and record company personnel from around the world. In 1992 they opened for Pantera’s 1st Japan tour and have toured with the likes of C.O.C. and G.B.H. In 1993, they transferred to MMG (currently Warner Music Japan) and their 5th album “Spit” was released soon after. In 1995, their 6th album “Life Until Deaf” that had included thrash, core, heavy rock elements gained them much respect as a crossover band. Their 7th album “Who We Are” followed in 1997 and in 1998, frontman Naoki parted ways with the band after their tour. The band then established their label 30min Records and in the year 2000, Yosuke, Yoshihiro and Shinya decided to continue as a three-piece rather than look for another singer. 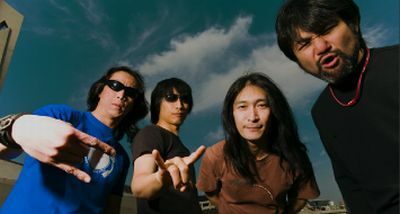 After releasing their first mini-album as a three-piece, “Volume One” and “Play Loud EP” in 2002, they released their 8th full length album “24-7”. The following year, to commemorate 20 years of being a band, “Nagoya Noise Pollution” was released and in 2004, they signed with Victor Entertainment resulting in yet another album, “Cause For Pause”. Not only did they start anew with this label, the once-departed singer Naoki returned to the band in 2007 to celebrate its 20th year and with this lineup they have sold out the Club Citta show and participated in the LOUDPARK 07 festival being showered with accolades there as well. Recently, in 2008, it has been officially confirmed by the band that Naoki will permanently be in the band again and a limited DVD+CD package to cover their 2007 tours, “The Years Of Rage” has been released. In March, Outrage embarked their “Awakening 2008” shows which looks back on Outrage’s highly acclaimed history by revisiting their classic “The Final Day” and “Life Until Deaf” albums. Music from these shows will be available on their limited edition live CD “Awakening 2008” to be released in June. They are currently back in the studio with Naoki Hashimoto after 11 years of being apart and working on a much anticipated original album again.